In the fitness center at the Ojai Valley Inn's new spa I came upon a woman battering one of the pieces of equipment. In her hands she held a clear plastic staff with rubber ends, and she was using it, martial arts style, to attack three six-foot-tall poles at the corners of a triangular arena. Standing at the center, she listened for one of the poles to emit a tone and then lunged in that direction, striking whichever of ten panels was illuminated before recovering to the center poised to respond again. After a few minutes she stopped, bowed to the machine and said: "It's fun. Want to try?" This device, called Makoto, represents a new generation of fitness equipment, according to spa director Kent Burden. It is at once physically demanding, and engages the mind. On one level it simulates a battle against three opponents, but it can be programmed to give you an extended cardiovascular workout. Either way, it helps develop hand-eye-coordination and reaction time, increases flexibility and tones all of the major muscle groups in the legs, trunk, arms, back and abdomen. I'd been drawn to the spa not by its fitness center but by a massage appointment after a morning of tennis. Nevertheless, I hung around because I discovered something called a VRBike, an entertaining exercycle with a video screen and sound effects that simulated a ride around a Caribbean island—except that I could leave the road anywhere and even take off under the sea in search of a sunken ship. And I came back because I wanted to test drive Makoto after the staff explained its potential benefit to tennis players. Essentially I was told me that in Makoto as in tennis you need to regain a neutral athletic stance each time: if you reach and stay put you won't be able to respond quickly enough to a light on a different pole. You need to attain a level of calmness to achieve the quickness essential at the more advanced levels (at Level 10 you're only allotted .74 seconds to respond). When you do, you begin to experience other perceptive states. Time slows down, euphoria sets in and your intuitive sense is enhanced: you seem to know where the next light will come on, just as when you're in the zone in tennis you seem know where the next ball will be. My closest encounter with another perceptive state came during a massage in a room unusual for having a fireplace. The spa adds another dimension to this historic 207-room inn in the Southern California hills. The building itself, with its Spanish architecture and walled courtyard, resembles an elegant hacienda, and like parts of Spain the interiors are rich in Moorish and Moroccan influences, especially when it comes to the elaborate and often very colorful tile work. If the point is to provide a setting psychically removed from the everyday world, then with me, at least, it succeeded. The Ojai Valley helps. Though only 14 miles from the sea and an easy two-hour drive north of Los Angeles, it is nonetheless secluded by its entourage of 4,000- and 5,000-foot mountains. Ojai itself has a small town's charm, numerous art galleries, a famous outdoor bookstore—Bart's Books—and several Spanish Colonial style buildings dating to the turn of the century. Yet most surprising of all is the town's long history of enthusiasm for tennis. For all but five years since 1895, Ojai has hosted an amateur tennis tournament (see Calendar for dates). It now attracts some 1,800 players in 34 divisions, including the Big West and PAC 10 championships. The courts at the inn are one of the major venues. Over the years a Who's Who of future greats have made early marks at Ojai, including Billie Jean King, Arthur Ashe, Jimmy Connors and Tracy Austin. The whole town becomes involved. The event uses about 100 private courts in addition to the four main sites, including the Thacher School where the event began. Every venue has a Thacher student as an attendant to provide towels and water. It's all very traditional. In Libbey Park, where most of the finals are held, the courts have the old green wooden stands and boxes. There is a tea tent, and ladies wear long dresses and bonnets. Late April is orange-blossom season and the groves out east near the Thacher School, where the junior events are played, are all in bloom. The atmosphere over those four days is electric. Meanwhile, the entire resort has just come through a $30 refurbishing, so complete that Renaissance might be a better description. The rooms were completely redone and the tennis complex has been undergoing major changes. The pro shop has been remodeled to match the Spanish Colonial architecture in the rest of the resort and the locker rooms there are about to be remodeled. There are four hard courts, under the direction of Tom Rohrbacher. He runs complimentary clinics for guests a couple of mornings a week followed by doubles play and in general emphasizes flexible, personalized service. Golf Courses. The Ojai Country Club Golf Course dates to 1923 and was one of the first great golf courses in California. Originally designed by George C. Thomas, Jr. and Billy Bell, this 6,252-yard, Par 70 course was subsequently updated by architect Jay Moorish, who made it considerably more difficult, with five par 4s over 400 yards in length, and two par 3s over 200 yards. Spa & Fitness Center. Architecturally appealing, 31,000-square-foot Spa Ojai further stands out for its Native American-inspired treatments, the handsome decor of its 28 treatment rooms, and its multi-dimensional fitness center. And ... In addition to its other recreation, the Inn has an 800-acre Ranch, whose stables provide a full range of equestrian activities, including daily rides for all levels of horsemen, lessons, and pony rides for children. Otherwise, there is a recreation field for softball, soccer, and sand volleyball. It also has a children's jungle gym and a Parcours series of workout stations. An Open, collegiate, and junior event centered in Ojai but whose early rounds are played at venues and private courts all over the county. As details for this year become available, we'll post them here. For more information and to purchase tickets online, go to www.ojaitourney.org. 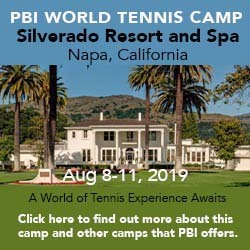 For more information, visit 118th Ojai Valley Tennis Tournament or phone: 805-646-7241. Lodging ranges from a selection of rooms, including a few historical rooms in the original building, to suites and cottages (the last have fireplaces and a parlor). Prices vary according to size and view: the best look out on the Back Valley, the golf course, or the Topa Topa Mountains. Rates include access to spa and fitness center and are subject to 13% rooms tax. Here's what others have had to say about Ojai Valley Inn & Spa.